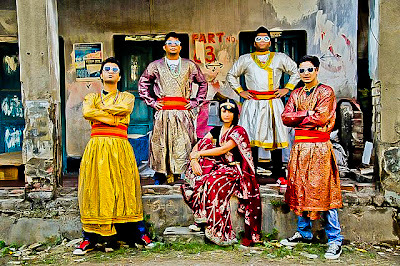 There are many things to love about The Ganesh Talkies - a five piece band that takes its name from a now defunct Kolkata cinema and landmark. Their music carries an enormous sense of fun. They embrace their Bollywood influences without feeling obligated to skewer it. Earlier this year, they released a cool four song EP called Three-Tier, non AC (you can buy it from OKListen!) which they promote in elaborate outfits with the same sense of un-ironic verve that is infused in their music. The Ganesh Talkies primarily creates really accessible pop songs. Their single Item Song has a sparkling, trippy accompanying video that combines art, culture, kitsch, dance and gender politics. It's a lot of fun to watch and listen to. I asked singer Suyasha Sengupta to introduce the band, the song and the video. Congratulations on the video release - really enjoyed it. What's the concept behind the song and the visuals? Suyasha: The video has been conceptualized directed and edited by Ayushman Mitra and shot by Rusha Bose. The idea behind the video was that anybody or anything could be an "item". While the video features women of various age-groups and socio-economic backgrounds, they are not objectified. They are strong, confident and beautiful at the same time. The song too, is a take on the quintessential chauvinist mindset of Bollywood. Instead of the man wooing the woman, we see that the woman is the one in charge here. I've known people who try to put videos together and struggle so much the video never gets made. How was it like for you putting this video together? Was it fun, was it painful, was it painful but worth the fun? Suyasha: Ayushman is not just a director but also an artist and it was his artistic sensibilities that helped shape the video. We wanted to create a video that was visually stimulating, while being fun and colorful. Also we pretty much roped in all our friends and family to be a part of the video. We used our domestic help, security guards and kids from the neighborhood (they are playing football in the video). The dogs too weren't spared and can be seen making cameos! Actor Rii Sen, who is seen in the video was a BIG help for us. She came to the set and nailed all her shots in no time like the rock star that she is. The video also features model Sneha Ghosh, Kheya Chattopadhyay, Ryan Peterson, and Sankalita Chakroborty among others - who all came down despite the last minute notice because they are friends of the band. Honestly, the video-making process was not painful at all because it was very do-it-yourself. We were anticipating a lot of hurdles but thankfully, we didn't have to face any because everyone was extremely cooperative and more importantly, everyone was having a lot of fun on set (which was the director's terrace, hah!) The video is a collective effort by everyone to showcase the indie scene in Kolkata which is booming at the moment. All those bright paintings in the video - where did those come from? Suyasha: All the artwork is by Ayushman Mitra for Ganesh Talkies. In the song, the words "you're my item bomb" are used to compliment a sublime woman. Do you think I should try that line in a club. Or, like in the movies, this won't work in real life? Suyasha: "Oh baby you're my item bomb" might just work, but you really have to FEEL that way. If a man or a woman makes you go weak in the knees and at the same time makes you want to break into Mithun-esque pelvic thrusts, then he or she might just be your item bomb! But yes, don't use this as a pick-up line (which is rather insincere) or you might get punched in the face. I hear you wear kitschy, colorful clothes at your gigs. Do you really just throw on what's in your closet when you come out to perform or are the clothes saying something about the band? Suyasha: All our gigs have a theme (disco, mujra, space men, chor-police etc). A GT gig is an audio-visual thing much like a movie. You hear, you see and thus you feel. We take our costumes very seriously because at the end of the day, it it our job to ensure that everybody who turns up for the gig has a good time and goes back home with a smile on their face. 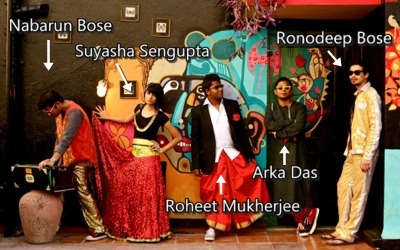 So Ganesh Talkies - who all is in the band and what is each person like? Suyasha: The band comprises of me who writes the songs, sings and plays guitar. I'm the youngest of the lot and my taste in music is rather bipolar - ranging from Nirvana to Sajid Wajid. Ronodeep Bose plays guitar for the band. The interesting thing about him is that he is also an actor. He is the only sane one in the band who does not make Hindi film references at the drop of a hat while making songs for Ganesh Talkies. Nabarun Bose plays keyboard and harmonium for the band. He is also a freelance arranger and programmer for Tollywood movies. Roheet Mukherjee plays bass and like all bassists, he is the big brother of the band who finds solutions to never-ending problems, musical or otherwise. He is also a part of the Kolkata indie-act Neel and The Lightbulbs. Arka Das plays drums. Being the senior-most, his experience helps fine-tuning the glitches. Ganesh Talkies is essentially five people who like to have fun and want you to as well! The current line-up has been together since November last year although individually, we've been playing music here and there prior to that. Your EP is called Three-Tier, Non AC. What an awesome name! It made me shudder and smile at the same time. How did you come up with that name? Suyasha: Non-AC trains are exclusive only to India, nowhere else will you find one. We wanted the name of the EP to be something that us folks - Indians - could relate to. Hence Roheet's brainchild- 'Three Tier, Non AC'. Our EP consists of three songs plus one bonus track. Ok enough about you, let's talk about Bollywood. What is YOUR favorite item song? Suyasha: Collectively, we prefer Bollywood music that was made in the 80s and the 90s - the period we grew up in. 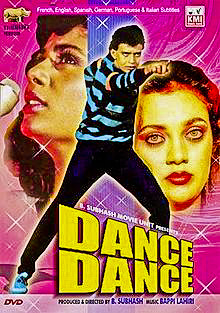 There were no item songs back then, there were romantic songs with coordinated clothes and dance steps to match. We love any song picturized on Govinda or Akshay Kumar and they are our favorites. Tu cheez badi hai mast mast comes to my mind at the moment! If you had to pick a Bollywood movie that most closely resembles the spirit of Ganesh Talkies, which one would that be? 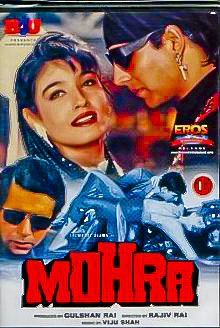 Suyasha: Most definitely Dance Dance [Mithun, Mandakini, Smita Patil] or Mohra [Akshay, Sunil Shetty, Naseer, Raveena Tandon]. Action, comedy, romance, drama, dancing - these two movies have all possible elements in them! Hi! I have really enjoyed reading your blog. Glad to have stumbled upon it! I'm trying to find an email address to contact you on to ask if you would please consider adding a link. Thanks and have a great day! Madison, I don't put email addresses up on the blog to avoid spam. Look up Aspis Drift on Google+ and drop me a line if you need to get in touch.